The meal is potluck, or as we jokingly say, “pot-providence.” Everyone brings food to share with everyone else. When the weather is nice, all the food is placed on a long folding table outside. A chest full of ice sits beside the drink table. Kids run wildly around. They are having so much fun that they must be rounded up by parents and encouraged to eat. After a prayer of thanksgiving is offered, people line up, talking and laughing as they load their plates with food. In the middle of all the food sits a single loaf of bread next to a large container of the fruit of the vine. Each believer partakes of the bread and juice/wine while going through the serving line. The smaller kids are encouraged to occupy one of the few places at a table to eat. (They sure can be messy!). Chairs for adults (there are not enough for everyone) are clustered in circles, mainly occupied by the women, who eat while discussing home schooling, child training, sewing, an upcoming church social, the new church we hope to start, etc. Most of the men stand to eat, balancing their plates on top of their cups, grouped into small clusters and solving the world’s problems or pondering some interesting topic of theology. The atmosphere is not unlike that of a wedding banquet. It is a great time of fellowship, encouragement, edification, friendship, caring, catching-up, praying, exhorting, and maturing. The reason for the event? 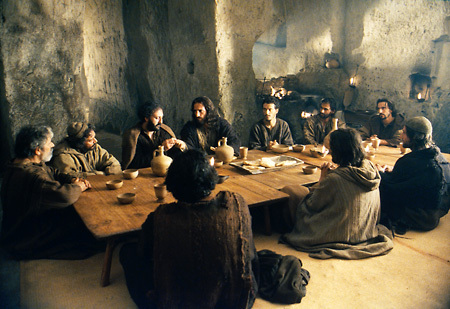 In case you did not recognize it, this is the Lord’s Supper, New Testament style! Foreign though it may seem to the contemporary church, the first-century church enjoyed the Lord’s Supper as a banquet that foreshadowed the Marriage Supper of the Lamb. It was not until after the close of the New Testament era that the Lord’s Supper was altered from its pristine form. If this was indeed the practice of the early church, should we not follow their example? This morning I enjoyed having a great breakfast with several men from various simple churches in Lexington and one of the men mentioned that this week their simple church wanted to have a “free” time together where everyone could relax and enjoy one another’s company. This conversation reminded me of an article (quoted above) that I’ve shared many times about one of the main purposes (if not the main purpose) of our gatherings. I have much to learn about the Lord’s Supper and I’m not sure I fully comprehend all that God intends for us to experience as we share a meal with Him. However, this essay has been very helpful for me and really does paint a beautiful picture of a gathering that is freeing, refreshing, simple, and very much vital to our faith. My prayer is that we all could experience this type of freedom and fellowship as we meet weekly with each other and with our Lord! May you enjoy the full article below and may it encourage you in the journey! Note: I do not endorse everything on this site… but I have found this article and this article on elders to be very helpful! These are so great The Lord’s Supper Illustrated. The most popluar is in the New Testament for a gospel of Jesus Christ our saviour.